Silviculture of species: Quercus suber. At the committee's 18th session held at FAO headquarters in Rome in April 2002, the future of Silva Mediterranea was the main topic on the agenda. Based on an external review of Silva Mediterranea and its networks carried out as recommended by the committee's previous session in Antalya, Turkey in October 1997, a number of changes were recommended to reinvigorate Silva Mediterranea. The committee proposed that the research networks be phased out and replaced by working groups with a specific mandate and clear objectives, outputs and time frames. It urged Silva Mediterranea to establish more effective alliances with other institutions working in the Mediterranean region. Member countries of Silva Mediterranea have since worked to implement these recommendations. The Committee Silva Mediterranea decided at its 21st Session in Antalya in 2012 to implement an evaluation of the Committee. The evaluation was decided at the end of the period 2009-2012 of the working plan of the working groups, and had an initial mandate focused on the achievements of the working groups referring to their 2009-2012 working plans. The evaluation was made by an independent panel composed of Ms Christine Farcy, Mr Alain Chaudron, Mr Ameur Mokhtar, Mr Placido Plaza, and Mr Giuseppe Scarascia. The evaluation started in January 2013. A midway progress report was presented on 17 June 2013 during a working session in Rome. 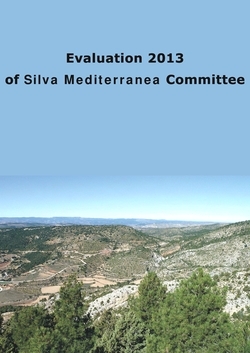 The draft evaluation report was presented at the 5th meeting of the Enlarged Executive Committee of Silva Mediterranea on 4 December 2013 in Hammamet, Tunisia. The final version of the evaluation report was presented on 27 June 2014 at the extraordinary session of the Committee organized during COFO 22. The Mediterranean Action Plan (MAP), adopted in 1975 at an International United Nations Environment Programme Conference in Barcelona, was originally aimed at controlling marine pollution and seashore protection. However, it soon became apparent that there was a need to extend the mandate of the MAP to the conservation of terrestrial ecosystems, with due consideration to socio-economic conditions and requirements. The Mediterranean "Blue Plan" was elaborated in response to such needs. Ecosystem conservation and the conservation of plant and animal genetic resources are addressed in the forestry component of the Blue Plan. The Blue Plan analyses the reasons for the degradation of Mediterranean ecosystems, draws attention to the actual and potential consequences of the often irreversible damage caused to them, and suggests measures for their future protection and management. In particular, the Blue Plan calls for the countries concerned to join forces in the implementation of a dynamic and coherent plan aimed at safeguarding the Mediterranean environment with the assistance of the international community. In 1988, the European Economic Community (EEC) adopted a Medium Term Action Programme for the Protection of the Mediterranean Environment (MEDSAP), complemented by a financial plan for investments in environmental programmes in low-income areas of the EEC (ENVIREG), including countries in the Mediterranean region. In the same year, the World Bank and the European Investment Bank launched a joint programme for the Mediterranean environment in which they formulated an environmental policy and identified investment needs of the Mediterranean countries. Natural resource depletion in the Mediterranean, particularly the degradation of forests and woodlands, led in the 1980s to repeated requests from countries for assistance in the elaboration of an action-oriented forestry programme for the region, along the lines of the national forest programmes operational in a number of tropical countries. This call for support was particularly strongly voiced at the Tenth World Forestry Congress held in Paris, France in September 1991. It was reinforced at the United Nations Conference on Environment and Development (UNCED) in Rio de Janeiro in June 1992, in which an appeal was launched at the highest level for countries in all regions to develop and implement national forest programmes. In response to these calls, the Mediterranean Forest Action Programme (MED-FAP) was formulated within the framework of Silva Mediterranea with the full involvement of the countries concerned. MED-FAP is conceived as a regional umbrella under which the elaboration and implementation of national forest programmes may be harmonized and promoted. It lays emphasis on sustainable forest management and the conservation of biological diversity and genetic resources.